‘In memory of Dave Goldwater, (1958 – 2005) , poet, storyteller, writer and stand-up. 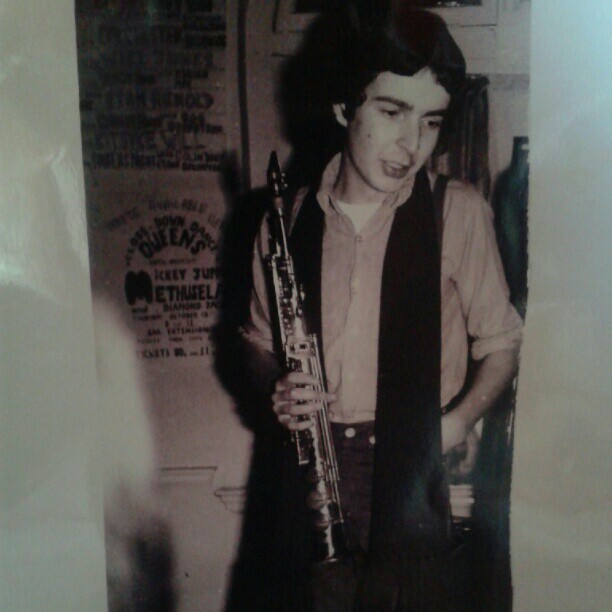 The dedication is under the picture of Dave playing soprano sax with us on a gig at one of our entirely inappropriate venues, a folk club, (it wasn’t our fault they had advertised an ‘open mic night’…..). We first met Dave – still a sixth form pupil, still in school uniform – when he turned up early for a gig we were playing. As there was nobody in the venue other than us and Dave, we left him to watch over the gear, and went out to find something to eat. He was still there when we came back, and he was still there when we had finished our set, and so he became one of the gang. As we got to know Dave better we found him inspiringly creative. He came from a London, working class Jewish, communist background. He wrote with originality and he was gifted with a particular comic genius, breathtakingly funny in print and in person. In company, he could improvise furious, multi-stranded comic routines of exuberant, sometimes splenetic energy. He was a gifted mimic and he minted character-defining catch-phrases by the dozen. Occasionally, he would need a helpful hand across the mouth, such as the time he began to develop a riff, delivered in a mawkish Irish burr, about ‘the old republican songs’ sitting at a table in a North London pub that had an IRA collection tin on the bar. Later, Dave enjoyed academic success, taking a first in English Literature and becoming an early, skillful exponent of structuralism. He was a great admirer of the then almost forgotten English avant-novelist BS Johnson, and wrote at least one critical appreciation of his work. In his prose and poetry Dave showed a great sensitivity to place and to placement in space, sometimes developing almost filmic meditations on chosen scenes and landscapes. Dave wrote poetry, stories, plays, stand-up routines, critical studies and song lyrics. He fronted, for a while, his own band in London, the tastefully-named ‘Sandy Richardson & the Wheelchairs’ and he played, on occasion, with us. Dave knew a thousand people. He touched each of our lives differently, but he left all of us diminished when he died. ‘I remember Dave Goldwater well, he and a few other folks used to come around my house for ‘free improvisation sessions’ circa 1977/78, and we would make a glorious noise, Dave playing his sax, Martin playing his guitar and me on chair or kettle or some such. Perhaps we fancied ourselves to be some kind of Evan Parker/Derek Bailey/Han Bennink outfit, but in reality all we did was upset the cat… I also remember us putting on a ‘free improvised gig’ in the underground car-park next to the Southend civic centre, publicised by hand written posters stuck up around the high street with sellotape, and jams in the room above ‘Its Surreal Thing’, a squatted art gallery and proto-social centre opposite The Cricketers in Westcliff with the likes of Dave, Andy Downs, John Shaw, Stefan Sukomski (phonetic spelling, sorry if you are reading this Stefan!) and others I can’t now remember. By one of those really bizarre coincidences many years later Dave taught my friend Steve at a university in Wales. I was shocked when I heard he’d died, even though I hadn’t seen him for some 2 or 3 decades’.